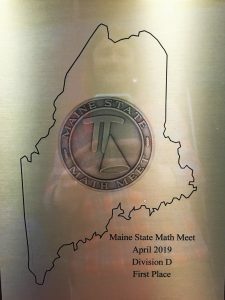 The North Yarmouth Academy math team took first place in the 43rd Maine State Math Meet. Approximately 100 teams, comprised of ten students per team, from around the state met at the August Civic Center on April 2, 2019 to put their mathematical wisdom to the test. NYA competes in the Maine Association of Math Leagues (MAML). Panther mathletes finished first in Class D at the state meet and second in class D for the season. Ashley Ren ‘20 finished seventh out of all the juniors in the state at the state meet. Ren also finished fourteenth of all students in the Pi-Cone South Division (regardless of school size) and fourth among juniors in the Pi-Cone South. The NYA team finished fourth in the small school division of Pi-Cone South. Hannah Gagne ‘19, Cam Goodrich ‘20, Xander Kostelnik ‘19, Cindy Lin ‘19, Ashley Ren ‘20, Andrew Schaeffer ‘19, Jack Schaeffer ’22, Candice Wang ‘19, Abby Xu ’19, and Aidan Yilmaz ’19. Holly Akey ’19, Hannah Gagne ‘19, Cam Goodrich ‘20, Ella Grady ’20, Xander Kostelnik ‘19, Cindy Lin ‘19, Ashley Ren ‘20, Andrew Schaeffer ‘19, Jack Schaeffer ’22, Amelia Searfoss ’19, Candice Wang ‘19, Abby Xu ’19, and Aidan Yilmaz ’19.